A provider virtual datacenter (PvDC) is used for compute and memory resources of a single vCenter server resource pool. Multiple Provider vDCs can be created as per requirements. They can also be defined for various geographic locations. It is good to have a PvDC mapped to a Cluster (also known as the Root Resource Pool). The main reason for this is to keep resource contention to a minimum, as per different allocation models. Apart from being a resource pool, PvDC also provides the ability to manage storage. Please note that compute (CPU and Memory) is managed at the vSphere layer, but storage (data store where VM resides) is managed by vCloud Director. For PvDC, it is mandatory to have same storage types since vCloud Director is not capable of managing different types of storage. If data stores are backed by a mix of SATA and SSD, then you have no control over VM placement on these data stores. Users can specify reservations and limits at the resource pool level in the vSphere layer; however these are maintained by allocation models from within vCloud Director. An organization virtual datacenter (vDC) gives resources to an organization and can be created by partitioning a Provider vDC.Users can create virtual systems through Organization vDC. Resources created in Provider vDC (PvDC) can be used in Organization vDCs. Hence, organization virtual datacenters consume CPU, memory and storage types from the Provider vDC. 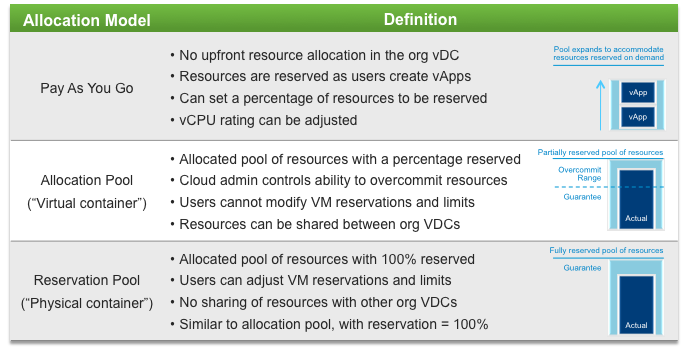 A resource pool is created within vSphere under the PvDC resource pool when an Org vDC is created in vCloud Director. It defines how resources come out of the Provider vDC backing the Organization vDC. Please take a look at the diagram below for an explanation of the three allocation models. Network which is external to VMware vCloud Director. External networks are created in the vSphere layer. Provides external connectivity to organizations which are present on vCD. At the VMware vSphere layer, it actually maps to a port. Port group is attached to vCloud Director as an “external network”. External Networks allow vCloud Director to connect to the outside world. An organization network is contained within a vCloud Director organization and is available to all vApps in the organization. Users can connect an organization network to an external network in order to provide external connectivity. Users can also create an isolated organization network which is internal to the organization. Some types of organization networks are backed by network pools. System administrators have the access to create organization networks. Inside a single vApp, users can create multiple virtual machines and vApp Network allows those virtual machines to communicate with each other. For communication with other vApps within the same organization or outside of the organization, users can connect a vApp network with the organization network. Network pools are required for vApp networks if the organization network is connected to an external network. Users with access to vApp can manage/create their own vApp networks. A group of undifferentiated networks available under organization vDC. Using VLANs or port groups, a network pool is backed by vSphere network resources. Network pools are used by vCloud Director and they create vApp networks and internal organization networks. 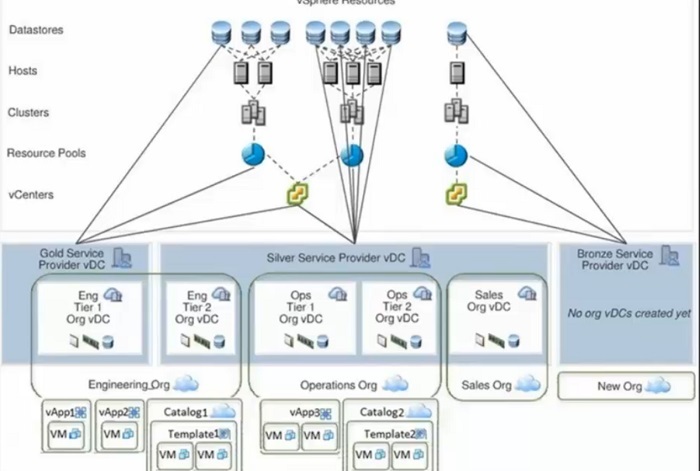 For one organization vDC, users can only create a network pool in vCloud Director. Multiple organization vDCs can share the same network pool. Network pool for an organization vDC gives the network quota for an organization vDC. Creation and management of network pools is done by system administrators. Multi-tenancy is a nice feature and vCloud Director supports it through the use of organizations. An organization is a unit of administration for a collection of users, groups, and computing resources. Authentication is provided at the organization level. After providing credentials, users can be imported or created by an organization administrator. Creation and provision of organizations is handled by system administrators and catalog, users/groups are handled by organization administrators. An organization contains several users and groups. Users can be created by the organization administrator or can be imported from a directory service such as LDAP. Groups are always imported from the directory service. Permissions are controlled using an assignment of rights and roles to users and groups. Catalogs are used for storing vApp templates and media files. Organizations created in vCloud Director can use catalogs. All members of an organization which have access to a catalog can use the catalog’s vApp templates and can create their own vApps.